The Martello Tower on the headland of Drumanagh was built in 1803 and is one of a series of such towers built on headlands and small islands each side of Dublin city as a defence against Napoleon. The building consisted of two stories, a basement for stores and magazine with the upper storey forming a casement for the defenders. The roof was considered to be shell proof, and had a huge trans-versing gun on a central platform. The entrance was by ladders to the door situated halfway up the wall. 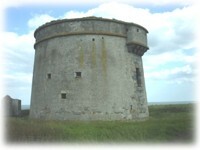 The Martello towers got their name from Mortella Bay in Corsica where the English forces were thwarted by one such tower, thus providing the idea for the construction of the same towers in Ireland. The towers were never put into use for defence purposes.